is a Series edited regularly ! Loading a Publication from eBA Basketball Statistics Analysis. The Euroleague players unite for the One Team program. Devin Smith and Walter Hodge clashed in the Game of the Week in Tel Aviv. The magician Derrick Brown knows how to put a spell on his opponents. Kostas Vasileiadis uses his magic to shoot from distance. We met French center Joffrey Lauvergne and Congolese guard Christian Eyenga. is a Series edited on Saturdays ! Fill your playbook with excellent motion and set offenses that will help your players become better on the offensive end of the court. 2013 USA Basketball World University Games Head Coach Bob McKillop details the offensive system he uses to put breakdown drills in place. You will learn how to teach the offense within your program and discover the concept of attacking the attacker to create flow and rhythm in your offensive. McKillop emphasizes simplicity, which enables players to read the defense and create the appropriate rhythm and flow. Using on-court demonstrations to present the basic principles of the Davidson offense, McKillop describes how these drills have created teams that are successful on the offensive end. You will learn how to teach your players to attack space, find the open man, catch and see the floor, dribble with a purpose, and finish the cut in order to make your half-court offense unstoppable. Coach McKillop uses on-court demonstrations to teach five drills that instill these concepts, yet keeps your offensive game simple. These drills will help players become better decision-makers on the court. 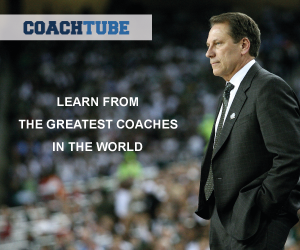 This is one of the best DVDs you can buy at any level to help teach players how to play basketball - not just a patterned offense. Coach McKillop's concepts are easy to implement at any level and will help every player develop into an offensive threat. Produced at the 2013 Tunica (MS) clinic.